Tattoos in the Studio by Andy Engel, are custom-made, customized designs, which are subject to the copyright of the respective artist. These creatives are not used as templates for other customers. Gastartists belong to the team, but always rent themselves in Andy Engel’s studio and work independently and on their own account. They use the premises of the studio for the time of their scheduled work and the conditions for them and their contractual partners are the terms and conditions of the Studio Andy Engel Tattoo. If you have questions about motifs, drawings or prices, please arrange a personal consultation with us to avoid long waiting times in the studio. We try to answer written questions as soon as possible. Please remember to leave your phone number and tell us about which tattoo artist you would like to have a tattoo. The lawmaker decides that you must be at least 18 years old for a tattoo. Please understand that we can only tattoo you! In exceptional cases we can also tattoo with a written declaration of consent of the parents before the age of 18. Clear your tattoo artist about serious illnesses in the first conversation! Only then is it decided whether it is at all possible to tattoo you. Tattooing during pregnancy and lactation is not recommended and is not practiced with us. An advance payment must be made in the case of an appointment agreement. These will be charged with the final amount later. In the case of payment by the customer, a contract is concluded between the customer and Andy Engel Tattoo. This also applies to all Gastartists in the team who use the premises of Andy Engel. If for any reason the deadline is not observed, this must be canceled at least 14 days in advance. In this case, the deposit will be withheld for pre-paid work. 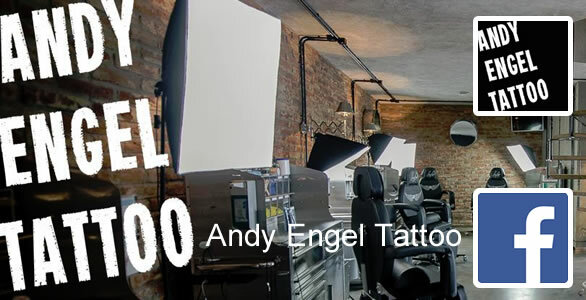 In the case of cancellation within the two-week deadline before the deadline or in the event of non-appearance, Andy Engel Tattoo will charge the client for the loss of the customer’s earnings. Please come on time! If you should be late, just call us! Otherwise, your tattoo artist reserves the right not to perform the appointment or only to shorten the appointment. We recommend that you sleep before your tattoo session and be fit and have enough to eat and drink (alcohol-free and caffeine-free). VERY IMPORTANT! Be clear to the tattoo date, otherwise it will not be tattooed !!! The following things must be observed! Depending on the skin condition, the care is a little different – you have to develop a feeling for how to care for your own skin (for example dry skin a little more cream than oily skin). Touch your tattoo only with clean hands and always protect it from dirt! Leave the foil for about 5 hours after your tattoo session! If your appointment ends late in the evening, you can leave the slide over night. When you remove the film, wash the tattoo with lukewarm, flowing water and use a pH-neutral, non-perfumed soap! Then gently pat dry and apply a thin layer of wound and healing ointment (e.g., panthenol). Then gently tighten (preferably loose clothing that does not lint)! Cream your tattoo daily 1 – 2x thin with the healing oil for a maximum of one week! You should protect your tattoo from direct sunlight in the first 8 weeks! Afterwards, we recommend that you always use a high light protection factor (50+). Avoid solarium, sauna and swimming pool visits! Sports and bathing are taboo for about a week! During the healing phase the tattoo can itch – Do not scratch! Proper care and treatment is the most important for a freshly tattooed tattoo, as it may lead to poor healing due to incorrect or negligent care, which would compromise the quality of the motif. In the case of a bad healing, in most cases the tattoo has to be pierced again, which in turn would be an unnecessary injury to the skin, at least if it could have been prevented by proper care. If you have any questions, just call us!